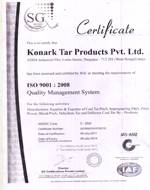 Established in 1993, Konark Tar Products Private Limited is one of the most trusted manufacturer and supplier of a wide range of Coal-Tar Pitch and Coal Tar Products. 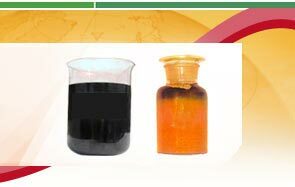 Our product offerings include Coal Tar Impregnating Pitch - zero QI, Coal Tar Binder Pitch, Blended Pitch - PCM and Dehydrated Coal Tar, Creosote Oil - Light/ Heavy /Mixed, Crude Naphthalene, Crude Anthracene and Anthracene Oil. Our entire range of premium products is manufactured by using fine quality raw materials, to ensure durability and efficiency. No wonder these products are appreciated by our clients for wide industrial applications, effectiveness and purity. Over the years our products are widely used across the industries like Graphite Industries, Electrode Industries, Refractories & Foundry Chemicals. Being a customer driven company we are focused to offer highest quality products to our valued customers, adhering to the Global Quality Standards. We stringently follow international manufacturing standards & pollution control norms to keep the emission level well within the permissible limits. In addition our R&D team is fully equipped to carry out carbon related testing to meet global regulations and specifications. Further to offer greater flexibility and choice to our customers we constantly offer new innovative products. Due to the consistent product quality, technical support, competitive pricing and on-time delivery, we are one of the most preferred names in the industry. Coal Tar Impregnating Pitch - zero QI. 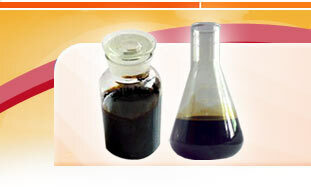 Coal Tar Binder Pitch for Aluminium Industries - Liquid and Solid. Coal Tar Binder Pitch for Graphite Industries. Coal Tar Binder Pitch for Electrode Industries. Coal Tar Pitch - Soft to Medium Hard. Blended Pitch - PCM and Dehydrated Coal Tar. Creosote Oil - Light/ Heavy /Mixed. Quality is one of the most important factors responsible for the smooth operation of the company. Hence, we strive to maintain the consistent quality standards in our products. For this, we procure raw materials only form the renowned vendors. These raw materials are quality tested before using. The entire manufacturing process is supervised by our efficient quality managers. They ensure that products are produced without any defects. In case, any flaw is identified then corrective measurers are taken. We own state-of-the-art laboratory equipment to conduct a range of tests. Our facility is regularly upgraded to assure products in sync with the latest tends. Based on our extensive experience, we try to improve the quality of our products to gain maximum customer satisfaction. In addition, our manufacturing facility comprises of advanced machineries and modern technology. Credit of our success and growth goes to our skilled team that has extensive experience and sound knowledge of this industry. Their hardwork and zeal to develop innovative products assures us that we will be always counted as one of the trusted manufacturers and suppliers. Our employees are given regular trainings to keep them updated with the market developments. It also enables them to stand in the tough situations. 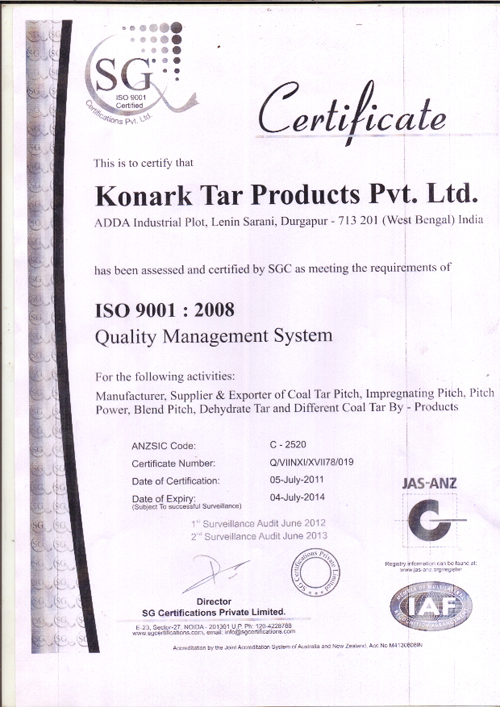 Konark Tar believes in satisfying customers by offering excellent quality, delivery, quantity and service. As a result, we have acquired a huge clientele, including some big names. Our team manufactures products keeping in mind the latest global trends and customer requirement. We offer our products proper packaging to ensure safe delivery.